With the increasing demand of the digital era, the technology has changing a lot. Technology has such an impact that, the revolutionary changes in mobile apps become one of the most integral part of human life. With a huge number and verities of mobiles apps, life has become more simplified. It seems one’s day is incomplete without Facebook, WhatsApp, Instagram or any other app. Literally, people are with mobile phone in any given point of time. Mobile app is not only helping people’s personal/or social life’s by browsing and shopping but also helps to develop their business’ productivity. Business owners are getting more& more dependent on mobile apps to get a high return on investment (ROI) in the competitive market. It has become the most ideal way to reach our target customers. A study says that the sales over mobile apps have gone up to 80% increase in sales. So, as a small or enterprise business owner, it’s very necessary to develop a mobile app to reach your target audience and the growth of your business. Let’s have a look at major reasons on how mobile app can help your business grow. In the digital age, more than 80% users have internet access and they are browsing through mobile apps. This can be clear with the above statistics. Users are always preferred to go with a seamless experience in a single platform and find related information on their move. Enhanced user experience, interface and services offered on a single platform will push customers to buy instead of hassling around from websites. Market research an essential part for the growth of any business. Mobile apps collect user’s data accurately according to their preferences. Collecting and analyzing data is much required when it comes to sales and marketing. The reason is that it gives an idea and information of users like, what is the origin, their interest level and the actions taken on the app. Market research helps to develop your business according to the user’s needs. Security always a big concern for all users. A user always prefers to go with quick, seamless and secure interface for transaction. Sensitive data such as credit card number, pin and password are usually replaced by symbols. The chances of leaking any sensitive and personal information are very less with mobile apps. Mobile app has integrated with secure mobile payment option; where customer/user always feels secure about their transaction and private information. Smooth and hassle free user interface always engage users and helps in retention. User loves to go with their single experience by putting your business right in their palm. Customer engagement is one of the most important metrics for achieving customer success and real-time, personalized experiences to customers as per their requirement can retain them. Measuring and gathering information on the way users are behaving with your brand and the level of trust they have on the information they received are the best way to engage more users. Real-time user data is always helpful for the growth of the business. Collecting and analyzing data helps in modifying your product and services according to the user’s preference. Because through a mobile app, the possibilities of getting users real-time data like the origin of the customer, their interest level and the actions taken on the app. Developing a mobile app is costly but it has countless benefits. When many potential customer or users will install it in their smart phones because of its features and usefulness, at that time it creates a special brand name in the market for your business. Through the mobile app, you can notify people about the latest offer, deals or updates that you are offering and also get feedback from users. Providing right information at right time for users through mobile app promotes your brand in the market. Customer is always great for your business and they can use your application anytime from anywhere. Quick business response made possible with the mobile app and this is the first think of customer satisfaction model. Mobile app track each and every activity of customers like their orders, purchase details anytime, view deals and so much more directly through their smart phones and communicate quickly. Mobile app transaction has increased in now-a-days because of its security, user-friendliness and flexibility. Once the users are confident with an app which delivers expectations beyond their imagination, they will spend without any hesitation. Apps that are more focused on user experience tend, generate more sales and revenue. 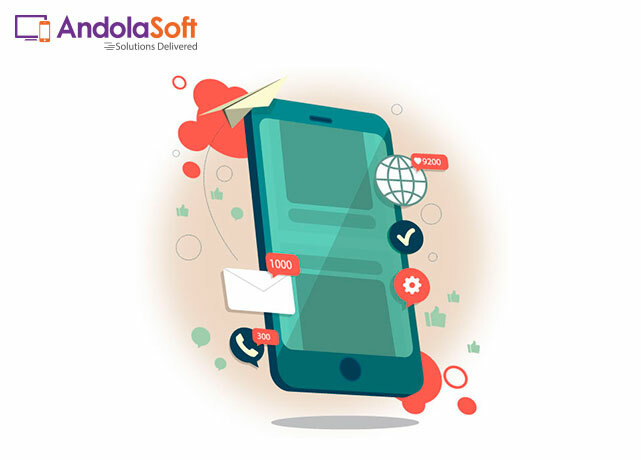 Mobile app is one of the best options to reach your global target audience within a short period of time and this will help you to survive and grow in the competitive market. The demand for mobile app is growing day by day and business owners are spending huge money to develop user engaging and secure mobile app to retain more customers. 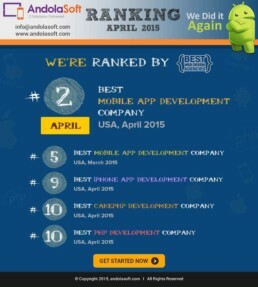 Andolasoft is one of the top Mobile App Development Company in USA. We are the certified mobile app development company from Applancer and Appfirms. We have experienced mobile app developers to convert your ideas to an initiative app which can stand in your target market.